With no replacement yet for the NEX-7, Sony’s reimagined version of the upper-mid-level NEX-6, now called the A6000, sits at the top of the range of the firm’s discrete APS-C mirrorless models. Although the built-in 1.44 million-dot OLED EVF may be seen as a downgrade from the 3.36 M-dot unit in the NEX-6, the new model offers several benefits over its 16-MPix predecessor, including the same 24-Mpix CMOS as the NEX-7 and an upgraded hybrid AF system with much greater coverage. Comprising 179 on-chip phase detection points and 25 contrast-detection points, it covers close to 90% percent of the frame with subject tracking. The A6000 also has continuous shooting of up to 11fps, a tilting 3-inch (921k dot) rear LCD, and improvements in video capture. Enhancements include the addition of zebra-pattern exposure warning and uncompressed 1080i/p AVCHD at 24/50/60 fps with an HDMI output option. It is, however, the sensor performance that we’re interested in here, along with how the expansion of the dedicated on-chip AF phase detection pixels affect image performance (if at all). We’ve tested over 23 lens models from Sony and third-party maker Sigma, including the new stabilized FE 70-200mm f4 G OSS; however, we’ve yet to assess the pro-video oriented FE 28-135mm f4 G OSS model and the new Zeiss Vario-Tessar T* FE 16-35mm f4 ZA OSS – all stabilized full-frame models built essentially for the A7 series, yet compatible with the A6000. 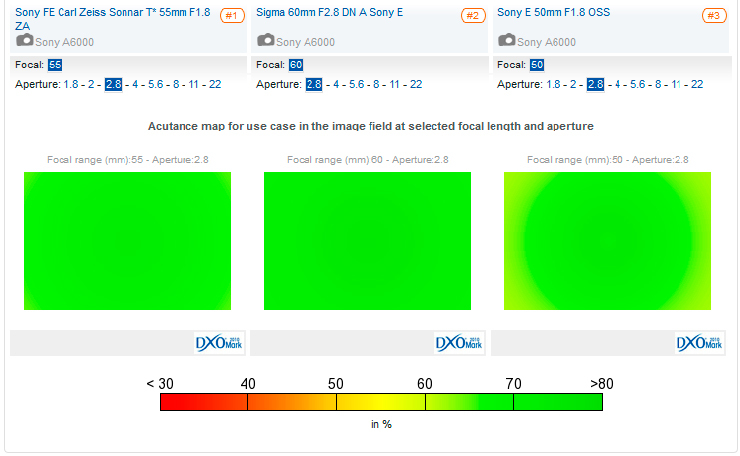 With a DxOMark lens score of 27, the best-performing model on the Sony A6000 is the Zeiss Sonnar T* FE 55mm f1.8 ZA. As an FE series full-frame lens intended for the A7 series, it has an approximate field of view of a 85mm short telephoto on the APS-C A6000. At $1,000, it’s somewhat at odds with the price of the body, but it comfortably outperforms the similarly-priced Sony FE Sonnar T* 35mm F2.8 ZA, in joint 4th place with 23 points and a lower peak sharpness of 11-Mpix. In second place is the new Art-series Sigma 60mm f2.8 DN A model at just $239. 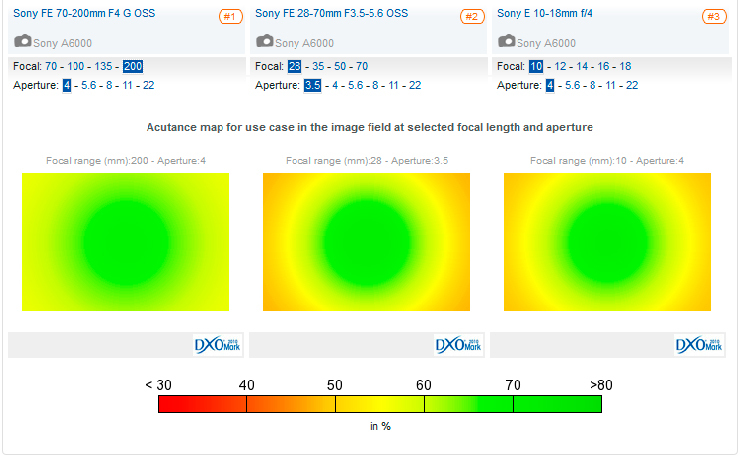 While it lacks the high speed of the Zeiss 55mm, it’s also designed with a smaller image circle (for APS-C). It has higher peak sharpness than the Zeiss, excellent uniformity, low levels of vignetting, and excellent control of chromatic aberration. In joint second place with the Sigma is the stabilized Sony E 50mm f1.8 OSS. It’s the equivalent of a 77mm on the A6000, but it’s still a good choice for portraits. Wide-open, it lacks corner sharpness but it’s sharper in the center than the Zeiss. In fact, there’s a good central core of sharpness to f2.8, but it can’t quite match the peak sharpness or the uniformity of either the Zeiss or the Sigma. Nevertheless, it’s a well-rounded model with a good blend of features, price, and performance. As for shorter focal lengths, the Sigma 30mm (45mm equiv.) f2.8 DN models stand out for their price and optical quality. Despite the maker’s claims that the optical construction remains unaltered, we were surprised to find that the newer Art or “A” series reimagining of the EX version isn’t quite as good a performer as previous models. Sony’s highly-regarded 24mm (35mm equiv.) f1.8 is strong optical performer, yet at $1000, it’s a pricey option for 35mm fans. The best-performing zoom on the A6000 is the one the latest additions to the range, the stabilized full-frame 70-200mm (100-300mm equiv.) f4. At close to $1,500, it’s not going to appeal to everyone, but image quality is very high and it will work with the full-frame A7 series (which it was originally designed for), so it’s arguably a good value in that context. It’s a great performer in the mid-zoom range (135mm) at the initial aperture, but sharpness declines rapidly towards either end. Stopping down improves both sharpness and uniformity, while both chromatic aberration and distortion is very low. In second place is the relatively accessible full-frame FE 28-70mm f3.5-5.6 OSS. It’s the equivalent of a 42-105mm on the A6000 and a slightly better performer overall than the wider, constant-aperture 24-70mm f4 OSS at $1,200. Uniform sharpness across the field isn’t exactly a strong point even on the A6000, but it is sharp centrally at all focal lengths. Chromatic aberration is a little high at shorter focal lengths, but otherwise it’s a good performer. In third place is the recently-reviewed Sony FE 16-35mm f/4 (see the review here). In fourth place is the APS-C-only E-mount 10-18mm f4. 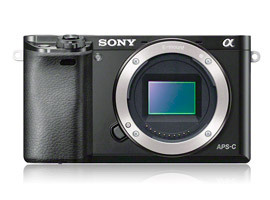 It’s the equivalent of a 16-35mm f4 — a highly desirable range for the A6000. At $850, it’s not exactly cheap, considering its only average performance (relatively low sharpness and presence of lateral CA) at full apertur,e but sharpness levels and uniformity improve from f5.6 onwards. One of the best all-round performers is the collapsible E-mount 16-50mm f3.5-5.6, which is often bundled as a kit lens. It’s sharper at the shorter end of the zoom range (like most models), and it requires stopping down a stop, but it’s very compact and lightweight. If you have a Sony A6000 and a favorite lens, we would very much like to hear from you. Please leave a comment below about the lens you have and why you like it.